After 21 years of Nightrace, the alpine Ski-World Cup, and biggest one-day world cup event, moved in to the town of Schladming. Up to 45.000 ski-fans transformed the Planai stadium into an international sea of flags and warmth (despite the obvious snow…) and the central hub of Schladming turned into the “Fan Mile”, jam-packed with high-spirits and fanatical ski-enthusiasts. Ahead of the main world-cup-winter-wonderland spectacle, the Sporthilfe Ski for Gold charity race 2018 ensued. Heather strapped on her Atomic Slalom Race ski’s and Uvex goggles (with VBites helmet intact) and took to the slopes. Competing against 64 other top able-bodied skiers and celebrity racers, and despite some treacherous conditions and warnings of avalanches, she flew down the slopes with enthusiasm and ease, to safely finish in an amazing second place. Toni Polster, Michael Konsel, Alex Kristan, Marisa Burger, Karl and Rudi Obauer as well as Heather Mills, Hans Knauss and Otto Retzer and many others. 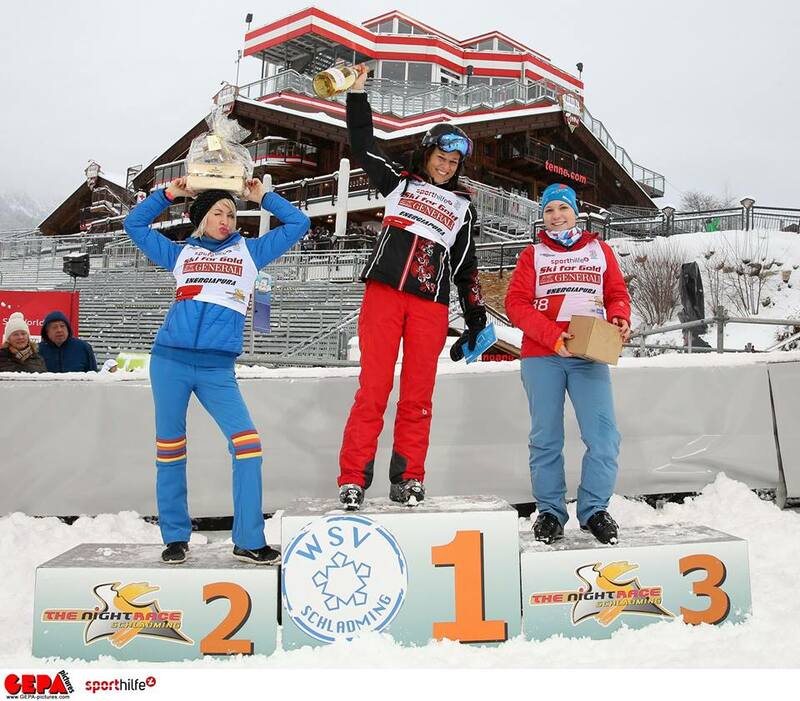 The Ski For Gold charity race helped to raise 14,000 euros. Year after year, there is no better way to feel at the heart of the event and ski community than to compete ahead of the night race, all for a very worthy cause for the Austrian Ski Association. The four-time world record holder and British Para Snowsport athlete already competed at the Celebrity Race before the women’s slalom on 7th January in Flachau – you can read all about the race here. Heather is the current record holder for speed skiing in the world, and broke many boundaries when competing for the title, now being the fastest disabled woman on the planet. In her bid to become the fastest disabled woman in the world, Heather headed over to Vars, France, and joined up with the Austrian Speed Ski Team in what would result in a world record breaking attempt, an attempt that would see Heather reach speeds of up to 166.84 km/ph (103.6 mp/h). On the 23rd January at the Planai Stadium, the world’s elite ski racers came together to tackle the challenging black diamond floodlit slalom course that night, each of them hoping to be on the podium. 50,000 people packed the pre-made ice block to watch the night race take place at the top of the metropolis. 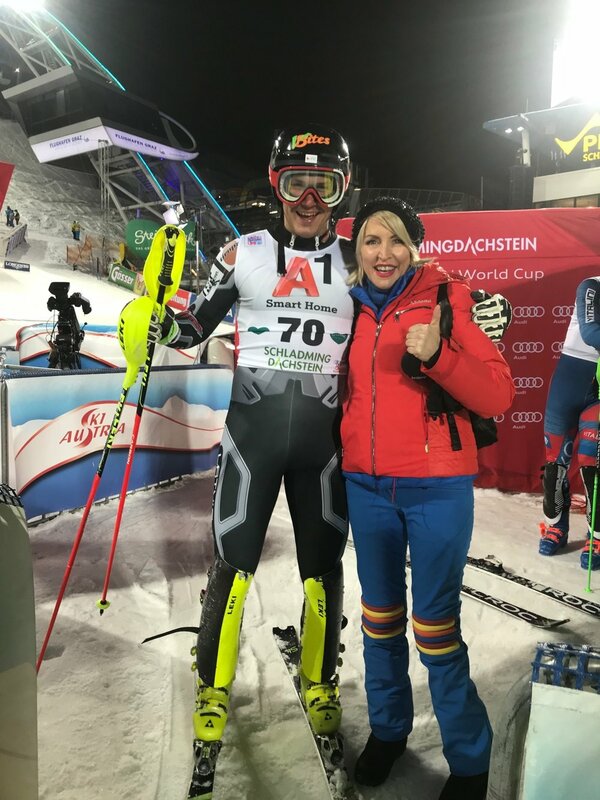 Marcel Hirscher (athlete of the year 2017) took the number one spot once again. Henrik Kristoffersen, in whose direction snowballs were thrown while driving, finished second. Daniel Yule (SUI) finished third. A familiar face was also competing this year - Kristaps Zvejnieks - who has been sponsored by VBites for a few years now and sports a flexitarian diet. With the help of Heather and VBites sponsorship, Kristaps is an Alpine ski racer and World Champion inline Alpine slalom racer from Latvia. He competes in FIS, CIT, EC and WC levels and had his first ever World Cup start in Schladming on 24 January 2012.